concept Boyle's Law shows the relationship between pressure and volume and will have the equation: P=(N(R)T)/V. Gay-Lussac's law is the relationship between pressure and temperature and will therefore have the equation: P=(N(R))/V * T, and the slope of the graph will be N(kb)/V. Charles' Law shows the relationship between temperature and volume and will therefore have the equation: PV=(N(R))T.
Equipments this is ideal gas law experiment-it is almost impossible to work this out in real life. 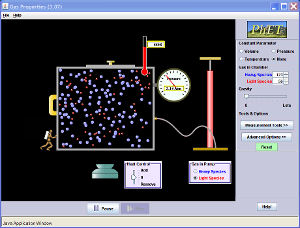 purpose Students simulate the ideal gas law (PV=NRT).The data that can be collected is based on Boyle's Law, which shows the relationship between volume and pressure, Gay-Lussac's Law, which shows the relationship between temperature and pressure, and Charles' Law, which shows the relationship between temperature and volume. concept When heat is transferred between objects, the temperature of the objects change. How much each objects's tempeature changes depends upon how much of the hear energy added or lost goes toward changing the kinetic energy of the object's molcules and how much goes to internal potential energy. Most materials have widely different specific heats. purpose Students measure the specific heat and molar heat capacity of several common metals. measurement of temperature might not be accurate because of thermal energy conversion. the measurement of mass or volume of water and ice might not be accurate.